Didn’t get enough info about Lynn Patricia of Massage Geek? Here’s the entire interview we did together. Hey Lynn! Tell us about your background. I took my first massage class in 1989 and worked with only family and friends when asked. I turned pro in 2002 or 2003…reports vary. I graduated from CenterPoint School of Massage and Shiatsu. I studied shiatsu first, and I think that was a big influence on my massage style, which is methodical, precise, deep. I had a lot of strength built up before I even started the massage portion of my training. I have worked in hospitals, a spa, a chiropractic office, and now own a massage clinic (opened in 2008), where I train certified therapists to do my style of massage. When I reflect on my life, with all it difficulties and joys, I can see how is was preparing me for what I do now. I told the universe that I want the same job in my next life, and if I have to go through all the same crap to get there, then bring it on! I had a large bundle of money to do whatever I wanted. I decided to travel in Ireland for two months and find my perfect career. Most of my adult life up to that point was spent working in retail management, and it was not very fulfilling. To find my perfect career I studied, meditated, went on a long retreat, took personality tests (I’m an INTP, it turns out), and one day realized that whatever job I have I will have to communicate with people. I [asked myself], “What is my preferred way to communicate? Is it writing? Singing? Performance art? Sales? Drawing? Teaching?” I ultimately discerned that touch is the way that I best communicate my heart and my intent. I signed up for massage school and on the first day of class I knew I was in the exact right place. Is it really exhausting work? I work smart, not hard. I leverage my body weight to get deep pressure, and take long breaks between sessions. I specialize in precision deep tissue massage for recovery from chronic pain and injuries. My focus has always been on rehabilitative massage, or what some are now calling “corrective” massage. 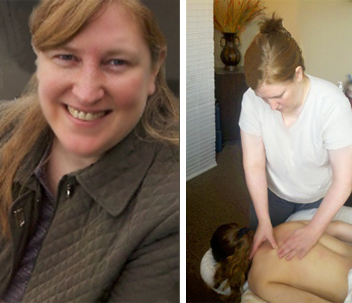 I recently hired a staff of five massage therapists to complement my skills and to teach them my methods. Many massage therapists burn out after a few years, either mentally or physically. I’m almost at the 10-year mark and feel like I get stronger and better each year. What can people expect when they come to you? The massage will be customized to meet the needs of the client. One reason people like my work so much is that I can change my technique to match their preference. If they like deep and aggressive, I can do that. If they prefer a more soothing experience, I can do that, too. Massages are a full hour, not 50 minutes or 45 minutes. In fact, I set aside 90 minutes in my schedule for every 60-minute appointment. This allows me to be completely present for the client and not worried about getting the room changed over for the next one. What should more people know about massage therapy? That it is not just about short-term relaxation. When applied by a skilled therapist, massage can lead to long-term relief and healing. What other services does Massage Geek offer? Shiatsu, reflexology, Structural Integration (Rolfing), and stretching. Is it important to offer different services? I actually try not to offer too much variety. I am focused on serving a very specific need. What about your industry do you wish you could change? I wish the State of Minnesota would regulate massage therapy. As it is now, it is left up to the municipality. I also wish therapists were more concerned about the science of massage. There is so much misinformation being taught in schools. For example, from the first day of class they told us that massage will flush toxins from the body. Not true. It can actually inhibit the elimination of fluids. [So, overall], I would like to raise the professional standards of massage. The single best moment is when a painful muscle releases and the client lets out a big sigh. It’s a huge compliment when someone wants a massage with me as their birthday present or Mother’s Day gift. I was never somebody’s birthday gift when I worked retail!